The month of June is named for Juno, Goddess and protector of women and marriage. And June is host to two powerful celestial events: the Full Strawberry Moon on June 9 and the Summer Solstice on June 21. We’re going to celebrate both of these with our Facebook Live Meditation on Friday, June 9, and you are invited! RSVP here. The June moon was named by Algonquian tribes because it coincides with the time of wild strawberry picking. So while the moon is not actually going to look like a strawberry on June 9, it is associated with the harvest of something luscious and juicy and good. Solstice, in turn, marks the longest day and the shortest night of the year, when the Sun is at its highest point in the sky and the moon at its closest distance to the earth. Think of it as a marriage of Heaven and Earth, Sun and Moon—and, because the Sun is an ancient symbol of the masculine and the moon of the feminine—Male and Female. Summer Solstice is a time to celebrate light, inner fire, and our own power to nourish and sustain. Combine that with the delicious harvest of not just strawberries but many wild herbs and early vegetables, and in Goddess Juno’s month we have a beautiful fertile energy that we can channel for our own juicy harvest. Build a bonfire in celebration of light and fire. Bonus points for drumming and dancing! Create a personal altar with candles, summer flowers, and strawberries. Meditate on your inner light and on the fruit you most desire to reap in your life, whether that’s a creative venture, a relationship, or a baby. Get up early to witness the rising of the sun on the day of its longest sojourn in our skies. Go out into nature to do this if you can. As we move into June, may the light of the Summer Solstice inspire your own brightness and nourish the growth of all you wish to bring to fruition this summer. 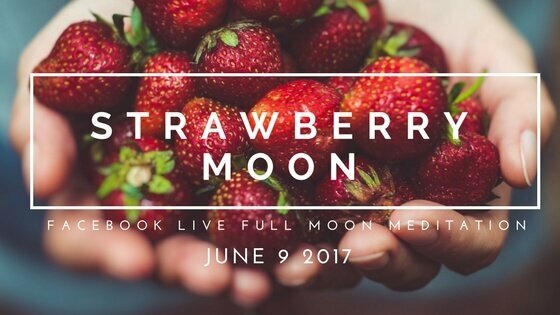 Tune in with me live on Facebook June 9th at 12:00 pm EST to meditate with the Strawberry Moon. Click here to get details.